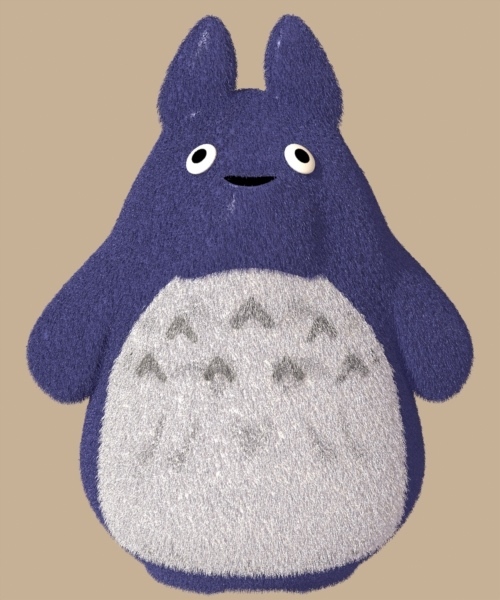 The finished Totoro, in modo. Wasn’t expecting my time to be free this afternoon, but instead of waiting all afternoon for nothing to happen, I sat down and finished the conversion and the tweaks, and walked the dogs and cat while the render took place. 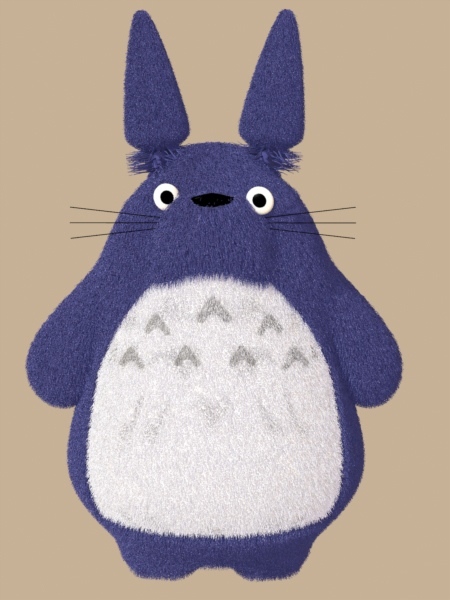 Saw a request online for a 3d model of Totoro, a Japanese creature character from 90’s Japanese cartoon art. I dug around and found a 3ds version, but it wasn’t exactly accurate to the original, so I did a little modification in the right direction to the mesh. I added some slightly tattered modo hair to the right material zones. There will be more modifications, nose, whiskers, feet, ears (the thinning at the base was totally ignored in the original, so I’ll probably have to remove the existing ears, patch the holes, and add new ones from scratch. It will probably take a few days. Back to see For the Sake of the Song, the Story of Anderson Fair tomorrow in La Grange, about an hour down the road. This will be my fourth viewing. Not sure who might show up, but I will know tomorrow afternoon. 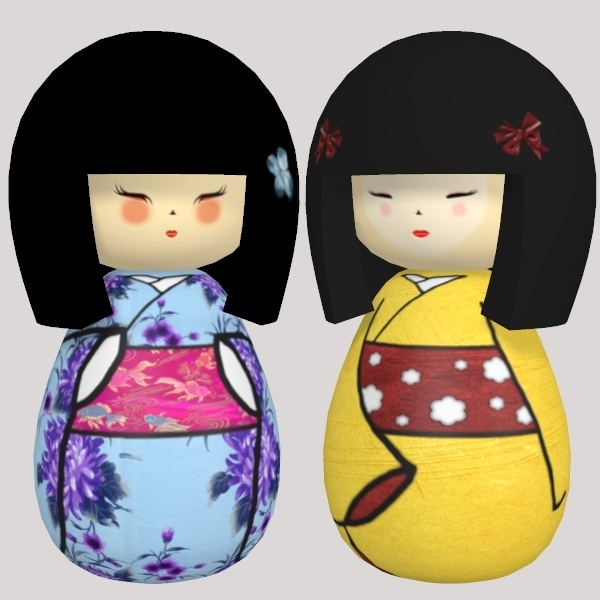 A couple of Japanese doll meshes with optional textures. 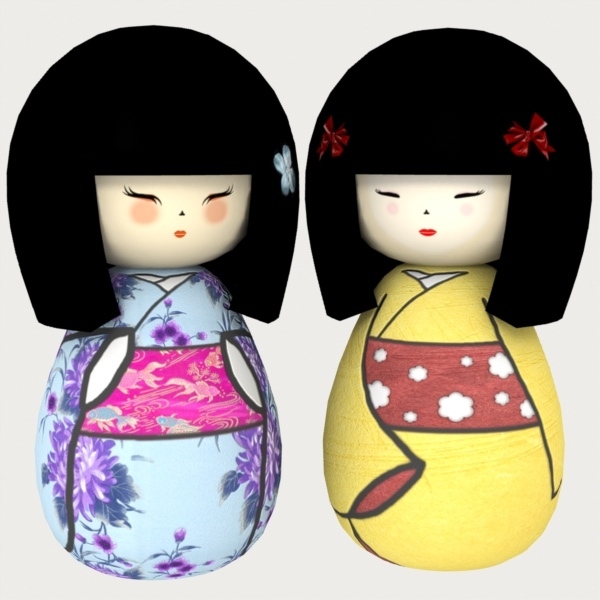 Reminds me a bit of Tiny Japanese Girl by Savlonic. Well, it seems that the lack of an Intel Mac has finally bitten home. I’ve been bemoaning the fact that modo 5 requires an Intel. I got over the need for an upgrade with Adobe, Autodesk, yadda yadda, yadda….. But modo leaving me behind is just too much (especially since I really like the new features of modo 5). I’ll just have to be happy with modo 4 until I can raise an extra $2k. The Mini shortcut just won’t cut it, I need some muscle and as many cores as I can afford (which is none right now). A lot taking place yesterday, including my lungs taking on less than friendly hydrocarbons from a mysterious source in the garage. Dogs are inside, nervously co-habitating with the frisky cats. Just as well, it’s cold. Throw in money issues, advising, receiving a shipped water heater (which needs to be installed in the currently cold garage), dealing with communications, house cleaning, green house watering, feedings, imposing cat curfews………. and considerably more, on top of work…… ugh! I watched a copy of Pinocchio today, and was amused to discover that the “A Pirate’s Life for Me” from Pirates of the Caribbean: Dead Man’s Chest was a rip-off of “An Actor’s Life for Me’ as sung by Honest John (the fox) and at various points thereafter in the animation. I’m not denying Disney’s right to rerwite the lyrics to a song that practically no one remembers. I just think it’s rather amusing about the source of the song that so many wannabe pirates are singing these days. Talk about some long noses…….